A New Advocacy Group had its Initial Launch in Washington this week. This Group will work on One Country that has been under the Radar in a very volatile part of Africa. The Region is the Gulf of Guinea. The Country is Equatorial Guinea. It is a Multi-Party Republic with a Strong Executive Branch. The Ruling Democratic Party of Equatorial Guinea (PDGE). Captured 91 out of the 100 Seats in Parliament in Elections that were conducted earlier this year. It is reported to have seen improvements in the Human Rights Climate over the last decade. The Country is experiencing a nice windfall due to the Discovery of Oil. In 2004 A group of Mercenaries were intercepted in Harare, Zimbabwe. During the Trial it was revealed that there was to be a coup in EG. Simon Mann the leader of the Force is now incarcarated in EG. Relations with the United States are said to be improving. Finally A Voice for Advocates concerned with Equatorial Guinea will be heard in Washington! 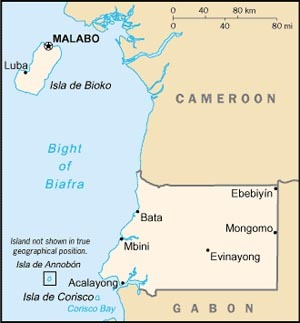 In 2002 a Border Dispute with Cameroon was settled by the International Court of Justice. In 2004 a similar effort was attempted with Gabon. The Island of Mbane and the Oil Rich Waters nearby were not resolved to the satisfacation to either party. It remains a source of tension to this day. Also in 2004 approximately 1,000 Immigrants were detained roughed up and deported from the Country. And just to make things more interesting a leader of a banned Opposition Party was tried in abstentia for Treason and Convicted. In the eyes of many Legal Experts this was not a free or fair trial. And to make things more interesting the Country has a Consulate in Houston.